Posted April 21st, 2016 by blake & filed under News. A County-Wide Climate Action Plan (CAP) that intends to provide a regional framework for addressing climate change. The plan builds on Sonoma County’s historic practice of reducing Green House Emissions through a combination of regional standards and local autonomy. The Climate Action Plan is being developed through a collaboration with the Regional Climate Protection Authority (RCPA), working groups from each local jurisdiction, as well as a stakeholder advisory group, among others. As cited by the RCPA, climate emissions in Sonoma County have declined since the 1990s. The concern is that these losses are expected to turn into gains, by 2020, if further action isn’t taken. This is why the current planning process is focused on near and long term goals. Posted March 30th, 2016 by blake & filed under News. California State Parks has proposed a plan to create Fee Collection locations along the Sonoma County Coastline. The proposal would allow for $8 day passes for entrance into some locations, while having $3 hourly parking fees in others. There would be a low income pass, and a credit system, but none of these elements have been concretely laid out. The plan has been re-submitted to the Coastal Commission for approval after the County unanimously rejected it. Posted February 24th, 2016 by kerry & filed under Archived Events. 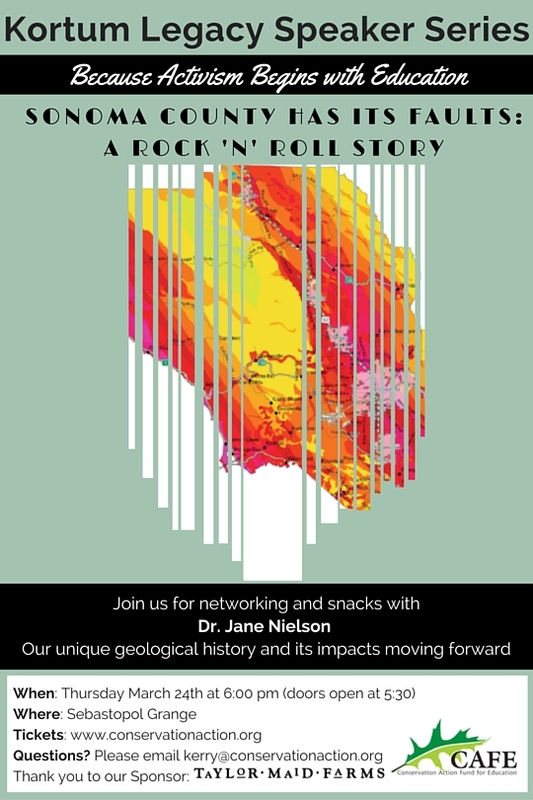 Join us for Dr. Jane Nielson’s explanation of the origin of our geologic hazards, why we always have to account for their effects, and how best to protect yourself and your family. Knowledge is power and being informed of the realities of living in Sonoma County is essential, as our communities rapidly grow and expand. Where in the County do you expect the greatest shaking to occur? Dr. Jane Nielson, who holds B.A., M.S., and Ph.D. degrees in geochemistry and petrology, and has worked 18 years as a field and research geologist for US Geological Survey, explains Sonoma County’s unique geological history and how it impacts us moving forward. Posted February 22nd, 2016 by kerry & filed under News. I feel so fortunate to have had the opportunity to be involved in the leadership of Conservation Action the past 13 years. When I discovered Sonoma County, I was awestruck with the biological diversity, the coast, the redwood forests, and the amazing community of people. The working agricultural landscape, vineyards, parks and open spaces coexisting with urban areas and little towns, all within an hour or so of the great City of San Francisco, almost seemed too good to be true. 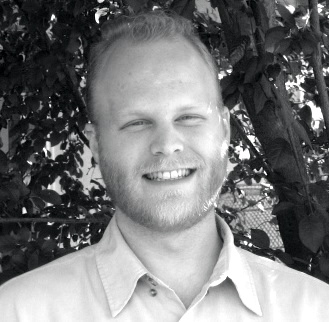 Conservation Action offered me the job as a canvasser that turned into a career as not only a non-profit program manager and eventually executive director, but as a full-time environmental activist. I was given the chance to use my education, my skills and my passion, putting it into action on a local level where we were able to realize results. I learned about electoral politics, relationship building, coalition building with like minded organizations and people, and the nurturing of ideas in the political sphere of local and regional government. Posted February 16th, 2016 by kerry & filed under News. How money will be used, and if there will be additional services for the community. Could create 2-tier access, with low income members of the community having to look for beaches with free access. Sonoma County, compared to Southern California, has significantly less public transportation options to the coast. Adding additional shuttles to the coast could cost more than $300,000 per year. If this option were to be explored, who would pay for it, and how would that factor into the proposal’s revenue goals? Will this fee plan unduly penalize the transportation needs of the disabled? It is unnacceptable to charge people more on sunny days, holidays, and other designated peak use periods. Variable charges may have negative effects on tourism, hurting the local economy as a consequence. The proposal has not addressed the possibility of direct or indirect environmental impacts. Two different pay station types have already been proposed. What type of pay station is being proposed now? What are the power, size, and maintenance requirements? What will the overall environmental footprint look like? If the proposal increases roadside parking, what will the affect be from environmental erosion and subsequent habitat displacement? Does the proposal take into account any possible changes in traffic patterns as a result of people searching for free parking? Does the proposal take into account the increased likelihood of fires from cars parked on the side of the road? Does the proposal consider the possibility of increased accidents between cyclists and motorists search for roadside parking? Posted February 3rd, 2016 by kerry & filed under News. Pro-development Coastal Commission appointees maneuver to terminate Dr. Charles Lester, undermining the power behind what has become a model for other states working to preserve natural beauty. There will be a public hearing in Morro Bay on February 10th. Please sign this MoveOn petition to express concern about the damage this could have on protecting our California coastline and preserving public access. Posted December 4th, 2015 by kerry & filed under Archived Events. 1. And the number 1 reason you should go to the Conservation Action Holiday Open House- It’s a party for YOU! Come out and have a good time with us and get to know Conservation Action’s team of board volunteers and dedicated staff. How: By bike, by car, by bus, or by sleigh- join us! Why: No-host bar, pot luck appetizers and desserts, Denny’s soup, and of course- the top ten list above! Posted November 19th, 2015 by kerry & filed under Archived Events. Are you up to date on the latest issues affecting Sonoma County? We delve into the hot topics of the proposed changes to the Local Coastal Plan, the current state of our Community Separator Policy, the most recent negotiations for Petaluma’s SMART station, and our recent actions on the issues in our latest newsletter. 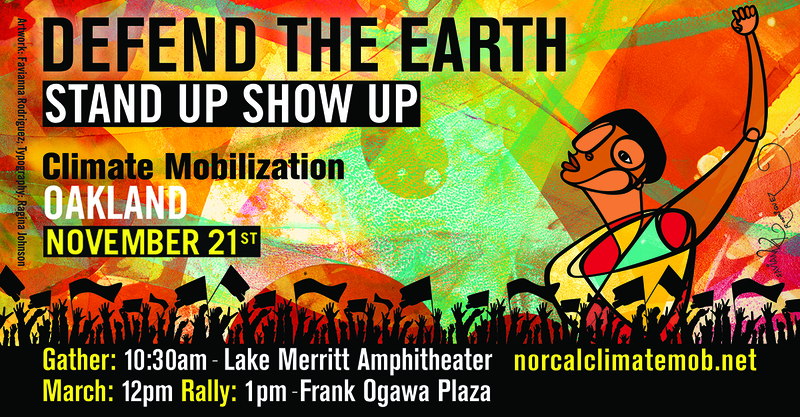 NorCal Climate Mobilization Rally- November 21st! Posted November 6th, 2015 by kerry & filed under Archived Events. Get on the Rally Bus! Stressing the need for action at the international Climate Change Talks this December in Paris, three North Bay environmental organizations have teamed up to encourage Sonoma County residents to join in a national climate mobilization campaign. 350 Sonoma County, Sonoma County Conservation Action and the Redwood Chapter of the Sierra Club are pooling their resources to provide bus transportation to the NorCal Climate Mobilization march and rally in Oakland November 21. In addition, 350 Sonoma County is inviting residents to participate in the “Redwood Revolution Community Climate Art Project” which will produce a ”forest” of redwood shaped recycled cardboard signs to deliver messages of hope and action at the Oakland rally. The Paris Climate talks offer the greatest opportunity in years for new international government action to address climate change. New Obama Administration climate policies, China’s willingness to begin new climate programs, the incredible moral force of Pope Francis, as well as increasing occurrences of climate disruption set the stage for real action in Paris. Without massive citizen action however, governments will not go nearly as far as necessary in signing serious binding commitments to curb global warming. The November 21 Climate Mobilization and similar events around the country and world will tell our leaders that significant action is needed now. The three North Bay groups have teamed up to rent buses that will leave from the Federal Building in downtown Santa Rosa and Sonoma State University. Buses will leave from the Santa Rosa Federal Building at 9am and return at 4pm on Saturday, November 21st. Roundtrip bus tickets are $20. In addition, the Sierra Club is sponsoring a special bus for Santa Rosa Junior College and Sonoma State University students at a reduced rate of $5. The bus will pick up and return students to the Santa Rosa Federal Building and the SSU campus. *Sonoma County residents can also participate in the Redwood Revolution Community Art Project. For the project, hundreds of Sonoma County residents are creating redwood trees made out of triangles of recycled cardboard that contain images and messages of climate hope and of what we love and want to protect. A moving forest of these trees will be carried at the NorCal Climate Mobilization on November 21.st On December 12th the triangles will be assembled into one giant redwood tree to be photographed aerially at a Sonoma County location This is the day after international climate negotiations conclude in Paris and is an international day of climate action. The image will be Sonoma County’s message of climate hope to the world. Please visit 350sonomacounty.org for more information about the Redwood Revolution Community Art Project. Decorate your triangle with images of what you care about in Sonoma County or the world (animals, trees, plants, open spaces, etc.). You can use any medium you want: paint, pen, cloth, collage, etc. What do you want leaders to do about climate change? What do you love that needs to be protected? Drop your triangle off at Sunny Galbraith’s house: 440 High St, Sebastopol. Placed them in the box by the mail box. Posted October 9th, 2015 by kerry & filed under News.